A collagraph is a printmaking process using collage materials applied to a board as a printing plate. To pull a collagraph print, apply collage materials such as acrylic mediums, carborundum, fabric, textiles, stencils, string, and a variety of organic material to a rigid substrate. Then apply ink to the collaged board and use it to print onto paper with an etching press. The resulting print is termed a collagraph. What is Encaustic Collagraph Printmaking? 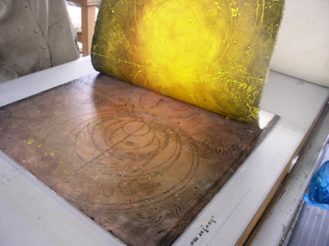 The Encaustic collagraph process uses encaustic wax in place of, or in addition to, collage materials. The unique process of encaustic collagraph printmaking combines the methods, techniques and tools of both encaustic painting and intaglio (incised lines) printmaking in the place of collage materials. 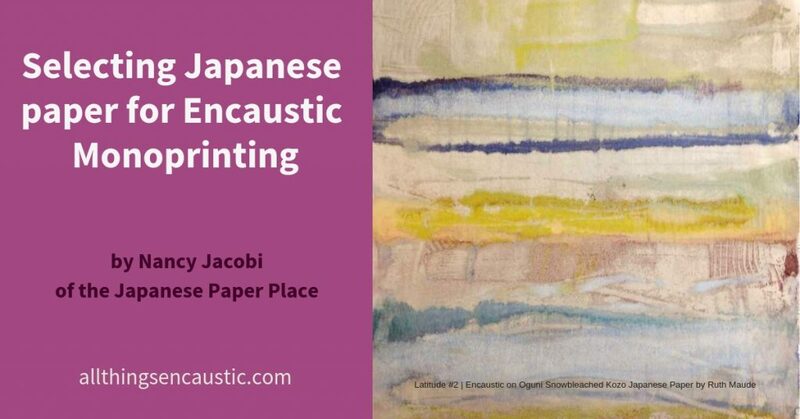 The texture, adherent and moisture resistant properties of encaustic along with its overall flexibility, makes it a highly exploitable collagraph printmaking material. Wagner Encaustic Collagraph White is a white encaustic paint for use on collagraph printing plates in lieu of collage materials. Wagner Encaustic Collagraph White is handmade in small batches by Elise Wagner. It is specially formulated to easily release from the paper when collagraph printing. Printing plates can be clear acrylic Plexiglas, cardboard, paperboard or mat board. Wagner Encaustic Collagraph White wax comes in a tin that you can simply set to heat on a hotplate or griddle. Once molten, you can apply the wax to your printing plate. Etch, scratch, carve or embossed into the encaustic medium. Typical tools for building the encaustic collagraph plate are ceramic incising and scraping tools common to encaustic. Fusing the wax is optional. 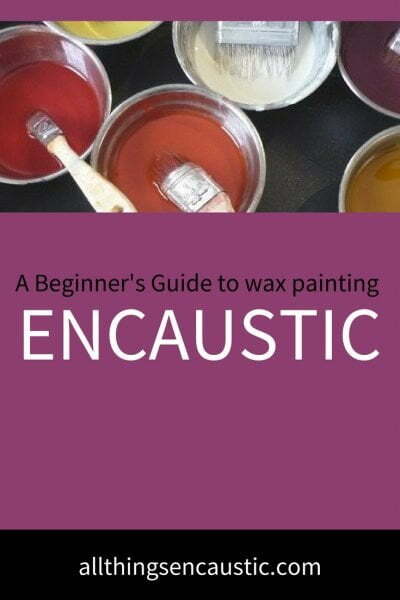 An encaustic iron or sealing iron is perfect for embossing fabric and creating ridges and textures in the wax. Heated tools, such a heated wax writer or batik tjanting tools are also recommended. Once you’re happy with your plate, you can apply ink. Do not use oil-based inks for this process. The natural beeswax in Wagner Encaustic Collagraph White forms the perfect marriage with Akua soy and honey-based non-toxic intaglio inks. The ink is applied and spread with matboard scraps or with a brush. Stiffer stencil brushes work best to get into encaustic textures. Once the plate is fully saturated with ink, wipe it with a tarlatan: a super-sized cheesecloth that skims over the plate and pushes the ink further into lines, marks and crevices. Akua wiping cloth is used for a final wiping on some of the raised relief lines and marks. To further highlight raised lines and textures, you can use a wet Q-tip to shade areas or erase the ink. As a finishing touch, you can also use a fine brush to hand paint or accentuate any marks or raised areas with a contrasting color. Akua Inks dry through absorption, therefore, I have found that encaustic collagraphs print best with wet paper. Some of the papers I have used are Rives BFK, Stonehenge, Arnhem1618, Fabriano, Kozo and Kitakata. When teaching, I used Arnhem 1618. We put the paper in a paper soaking tray with water while making and inking the collagraphs. My press is a Takach 24″ x 48″ however, they come in a variety of sizes. I first started experimenting using a rolling pin and, although it makes somewhat of an imprint, the etching press is definitely the way to go for the best results for collagraph printing. Once your plate is inked and wiped, it is time to register the paper and set the press pressure. I take the paper out of the soaking tray and blot it on a towel. I then place the paper on the press, register it and weigh it down with a paperweight to keep it in place while I set the plate on the press. All presses vary on what is the best pressure and settings will be different depending on the width of your printing plate. I tend to use 1/8″ thick clear acrylic plexiglass. I have also printed using 1/4″ Plexiglas and the pressure is different. I keep a log at my press and write down all pressure types for all the plates I work with as a reference. It is important to use 1″ foam between or in place of the press blankets when printing any type of collagraph. The foam allows for a better and richer print and is forgiving to the raised collage materials on the collagraph. After pulling the print, it is blotted with tissue paper to remove any excess ink that didn’t absorb into the paper. You can place the print on the wall or in a drying rack overnight before then flattening under a heavy piece of glass or books. Once flattened you can number and sign the print. It is possible to use the plate, again and again, varying the colors for small editions. Optionally, you can further enhance or alter the plate after making one unique print from it, this would be considered a monotype (one). When editioning monoprints, because these plates make up to 20 prints, I will number them 1/20 and sign. Monotypes can simply be 1/1 and signed. If you have any questions, post in the comment section below. I would be happy to respond. Elise Wagner has been a painter and exhibiting artist since 1990. Originally from the New York area, she studied Painting and Printmaking at Portland State University and has been painting with the encaustic medium since 1993. As a teacher, Elise brings over two decades of experience as an exhibiting artist, paint maker and educator to her studio classes. What a joy to find this tutorial. A recent convert to encaustic (via Nancy Crawfords brilliant online course) I love collagraphs – who’dathunk I can combine the two… woooo!